"One of the first things I realized after getting my Zune was that although listening to it through a premium set of earphones was nice, there were going to be plenty of times when I wouldn’t want to hear my music that way. Times when I would want to hear it playing over a better sounding system than the craptastic speakers on my laptop. Figuring out how I was going to accomplish this became my goal, because the fact of the matter is that there is a certain other digital music player that currently enjoys most of the after-market accessory love from all of the premium music dock companies. That’s why I was very interested when I saw the announcement that Altec Lansing - one of those premier music dock companies - would be producing a M604 Powered Audio System specifically for the Microsoft Zune." 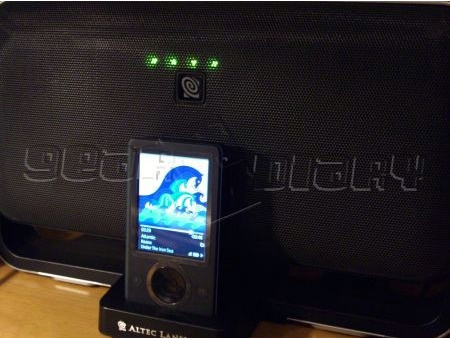 Gear Diary's Judie Hughes has just reviewed the Altec Lansing M604 Powered Audio System for the Zune. At $199.95 (or slightly lower, if you shop around), you can expect great sound and great looks, so if money is no object, you may want to consider one of these beasts as an accessory.